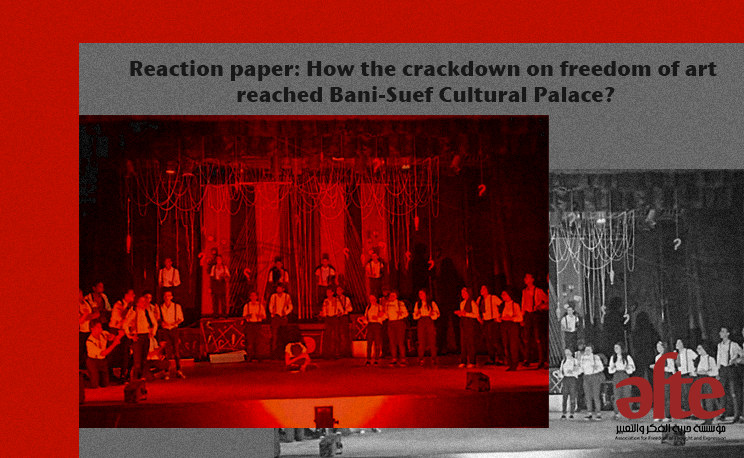 Reaction paper: How the crackdown on freedom of art reached Bani-Suef Cultural Palace? Association for Freedom of Thought and Expression condemns The Civil Defense suspension of the preparations for The Arabic Music Carnival and ban of the public event, which was meant to be held in Bani-Suef Cultural Palace. On The 31st of August, a security force consists of four men has raided Bany Suef Cultural Palace Theater for allegedly a periodic safety check. However, the four police men have verbally and physically assaulted the cultural palace officials including the head of the palace, Mohamed Abd-Alwahab. The Main responsibility of Civil Protection is to ensure the safety and security of public facilities, along with filing periodic reports on the state of Cultural Policies and the safety of public events. According to Article 32 of the Criminal Procedural Code, Civil Protection forces hold the right to arrest; filing arrest reports and detaining officials who do not follow the safety measures till police forces arrive. However, In Bani Suef Cultural incident, Civil Protection did not abide by these guidelines. First, Civil Protection men refused to show their identity cards to the Cultural Palace officials, which contravenes Article 24 bis of the Criminal Procedural Code. Second, Civil Protection detained the head of Bani Suef Cultural Palace in the Civil Protection premises, and they seized the ID cards of the officials for hours. Moreover, they criminally investigated one of the workers with a beard as they suspected that he is member of the Muslim Brotherhood “terrorist group”. The security force has also pushed the head of the Cultural Palace into signing a report that entails that the Palace is not safe to host any events. Association for Freedom of Thought and Expression expresses its concern about the Civil Protection turning into a new tool to control freedom of Artistic creation in Egypt. This is evident in recalling the burning of the theater incident of 2005, as the head of General Authority for Cultural Palaces has mentioned that the burning of Bani Suef Cultural Palace has been playing a major role in the decisions of the Civil Protection. Workers at Bani Suef Cultural Palace have been facing difficulties in having permissions for public events. In 2016 the governor of Bani Suef suspended all the activities of the palace acting upon a request by the Civil Protection. The burning of the Palace in 2005 has left a huge impact on the activities of the palace till today, as the burning claimed the lives of tens of civilians. Since then, the palace went into many renovation process that continued till 2009. In his interview with the association, the head of Bani Suef Cultural Palace asserted that, unlike what was stated by some sources from the ministry of culture and published by Sada Al-Balad newspaper, The palace provides theater and other artistic events, last event was the Comedy Carnival during the feast in August. These events are attended by state workers and authorities. Sada Al-Balad has mentioned that Bani Suef Cultural Palace is in state of despair and not available for hosting events due to the lack of safety measures. AFTE stresses on the importance of the shows represented by the Cultural Palaces across the governorates, specially during the recent crackdown on artistic activities. Cultural palaces have become the last vent for cultural activities in different governorates. Thus, those practices of the Civil Protection are a misuse of noble aims such as the public protection and safety. It is worth mentioning that Cultural palaces are state organizations, and developing them and providing them with all technical needs including the safety system are the responsibility of the state. This should be done through the sufficient funds to enable them to play their needed role in the cultural life in Egypt. Finally, the Egyptian constitution holds the state responsible for supporting arts and culture. Soon enough news about the practices of the Civil Protection in Bani Suef Cultural Palace and raised a lot of anger in the arts and culture society. This anger was heightened when the Mohamed Abd-Alwahab announced his resignation from his position as the head of the palace. The head of the palace felt abused and mentioned that one of the officers called the palace a “brothel”. The minister of culture, Inas Abd Al-da’em and the head of General Authority for Cultural Palaces, Ahmed Awad, soon reached out to Abd-Alwahab and assured him that they will fix the situation and ensure the continuity of the events. Head of General Authority for Cultural Palaces, Ahmed Awad has held a number of “unofficial” meetings with the security director of Bany Suef and other security officials. In their last meeting, Saturday evening, they agreed to proceed with the palace events and that what happened is an unacceptable behavior by the Civil Protection officers. AFTE questions the value of these “friendly meetings” as a method used to stop these violations of freedom of artistic expression, and calls for opening a transparent investigation of the matter with a publicly announced decisions. This is needed to stop similar types of violations. It is clear that the state institution have been following policies of increasing suppression and limitation of general freedoms since 2013. Furthermore, there is a narrative adopted by the government and the president Abd-Alfattah Al-Sisi which antagonizes media and culture. Since the start of this year, two decisions were taken which hold severe limitations of freedom of artistic expression; the vice president ordered the foundation of supreme committee for festivals and celebrations, and the minister of culture ordered the foundation of 7 offices for censorship on art. This increasing suppression limits the access of citizens to art, specially those who are geographically away from the center. This, AFTE appeals to the Ministry of Culture to take the necessary measures in order to achieve a complete coordination between its institutions and other ministries and ensure the citizens rights to access arts and culture. In this regards, the association reminds he minister of culture, Inas Abd AL-Dayem with her early announcements, in which she asserted that developing the Cultural Palaces is a priority of the ministry strategy.